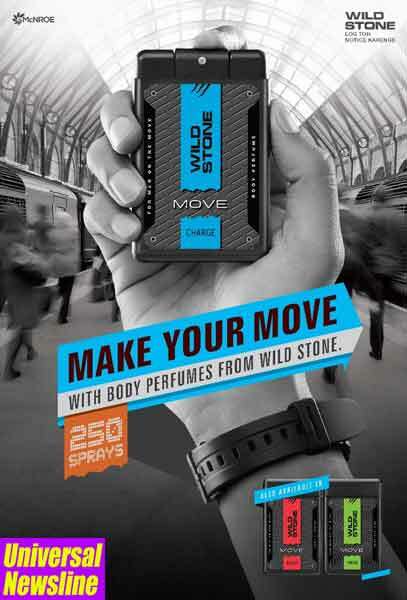 New Delhi, 18th January 2019:Leading fragrance house, McNROE has diversified its product portfolio with launch of WILD STONE MOVE & Secret Temptation GO range of fragrances. Categorized as Compact Body Perfumes, the new fragrances arrive in a sturdy 18 ml pack and guarantee 250 sprays/ vial. Both WILD STONE MOVE & Secret Temptation GO have been specially created given the need for affordable and convenient fragrance solutions amongst the youth today. Commenting on the launch, Mr. Sanjay Srivastava, Chief Business Officer, McNROE said, “The youth in India is evolving and so is their attitude & lifestyle. They are now more conscious about their appearance and it’s heartening to know that smelling good is becoming a part of a daily grooming routine and is not just restricted to special occasions. This compact 18ml perfume pack allows both Men & Women to access their favorite fragrances anywhere, any time.”WILD STONE MOVE & Secret Temptation GO variants are tentatively priced at INR 65/- each and readily available at leading retail outlets across India.